A young endangered Ocelot is pictured in a corridor on State Highway 48 in Brownsville. During the past couple of years, the Texas Department of Transportation has built wildlife corridors at several locations in Cameron County in hopes of helping wild animals make it across the busy highways. BROWNSVILLE — During the past couple of years, the Texas Department of Transportation has built wildlife corridors at several locations in Cameron County in hopes of helping wild animals make it across the busy highways. 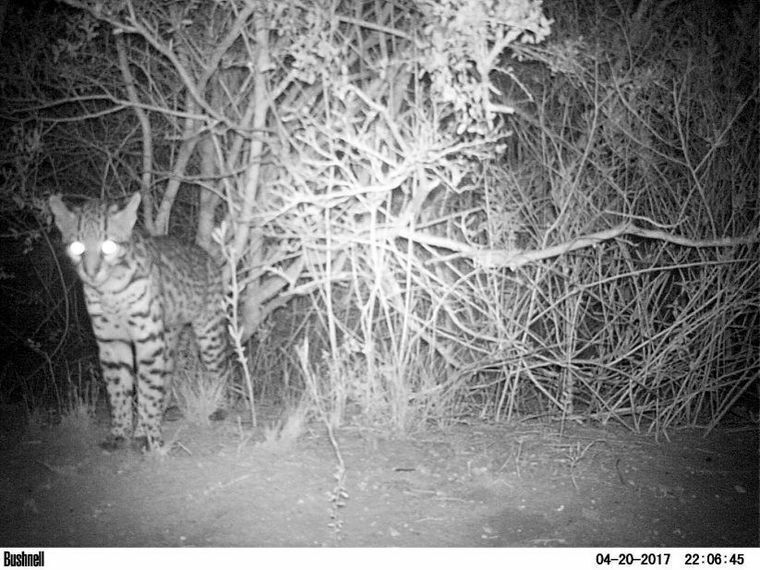 On Wednesday, TxDOT released a photo of an endangered ocelot using the corridor under State Highway 48 in the Brownsville area. The picture, which was taken with a motion sensor camera in April 2017, shows the ocelot coming out of the brush near the corridor opening and almost looking straight into the camera. In July 2016, a $5 million grant was used to install four corridors on Highway 100 between Laguna Vista and Los Fresnos. They were built every half-mile. East of Rio Hondo on FM 106, eight permanent wildlife crossings — at a cost of $1.8 million — were installed on the road leading to the Laguna Atascosa National Wildlife Refuge. Refuge officials say the wildlife crossing on State Highway 48 near the Bahia Grande has been used by bobcats, raccoons and coyotes. Wildlife experts hope the animals use the under-the-road tunnels to avoid being struck by vehicles. Throughout the years, a number of ocelots have been killed on roads in eastern Cameron County. TxDOT said it has an environmental affairs division that is responsible for integrating environment considerations into all road and highway projects.